Brazil has experienced strong socioeconomic changes in recent years, including the reduction of poverty, the rise of a new middle class and higher proportions of older people. One of the main demands that accompanies and drives this movement is expanding access to higher education and the growth of lifelong learning needs. 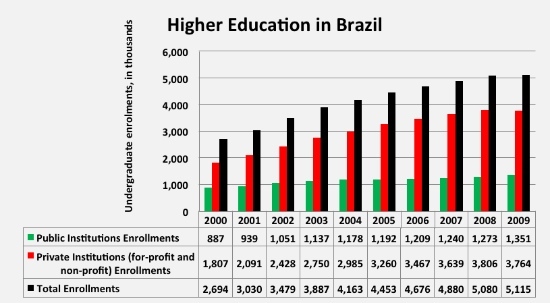 The main feature of Brazilian higher education is its heterogeneity. An establishment may be distinguished from another, under various formal aspects: its institutional (university, university center, a federation or integrated schools or college); administrative category (public or private), the legal personality of its sponsor (government, foundation, civil society or private), whether or not for-profit, its constitution as secular or confessional institution, and is confessional, the religion or church to which it related. Distance Learning is growing dramatically in Brazil in the last 10 years, somehow accompanying and collaborating with the social and economic changes that Brazilian society is experiencing. It should be noted that the numbers of undergraduate distance learning entrants in the period between 2004 and 2008, growth always equal to or greater than 40% per year, reaching a peak of 407% in 2005. The percentage of students in distance learning among all higher education enrollments emerged from the level of 1.4% in 2002 to 16% in 2009, peaking at 19.8% in 2008, falling to 14.6% in 2010, thanks to some changes in national legislation. Almost one in six students enrolled in undergraduate studies in Brazil enters into a distance learning course. It is expected that the number of distance learning enrollments triple and reach 3.1 million over the next eight years. This expansion will occur, mainly on account of a group of about 20 million people, aged between 25 and 39 years who graduated from high school but not enrolled in college. Proponents of distance learning note that are good the results from the national exams applied by the Ministry of Education, which evaluates both – on campus and distance learning – higher education courses. Only in recent decades is that illiteracy was seriously faced in Brazil. However, television is present in the vast majority of Brazilian homes for over 40 years. The same for cell phones in the last 10 years. This means that in many places, especially in the countryside, it is common that television has become the primary means used to inform the population and learn about the reality around them. Perhaps it can be identified as a factor that facilitates the adoption of TIC by Brazilians, who look as have less resistance than other people in this regard. Another important factor that drives the adoption of distance learning and educational technologies, including for children and teenager’s schools, is the ease with which digital natives adapt to this new world and begin to show impatience with the traditional teaching models. However, if we consider the Informal and Non-Formal Education, a recent survey showed that 11% of Internet users in Brazil use the computer for some distance learning course. In that context, Open Educational Resources (OER) must be seen as a promise still not accomplished. To the ones with internet access is possible to find useful digital materials to teaching and learning, but mostly which are not in the public domain or openly licensed to be used or adapted by others. The use of open technical formats or licenses to facilitate access and potential reuse of published resources digitally is not widely adopted, especially by the private institutions. On other hand, governments and non-profit institutions are producing open full courses, parts of courses, modules, textbooks, research articles, videos, tests, software, and any other tool, material or technique that can support access knowledge as part of OER public policies. A more deep analysis about recent efforts in that field can be found at the book “Open educational resources in Brazil”, by Andreia Inamorato dos Santos for Unesco Institute for Information Technologies in Education. The fast growing expansion of OER in Portuguese has created appropriate conditions for its adoption by educational institutions, whether private or public. In countries like Brazil, where socioeconomic inequalities are a huge problem, OER can contribute to making education more accessible. To do so, we must rethink the didactic and pedagogical practices to develop new approaches. It means also new organizational models. Written by Luciano Sathler on February 21, 2012 in Open and Distance Learning. A decade ago Brazil was being considered a third country. Look at it now! Tell me about it. I am really impressed by the increase in distance learning. The bar charts are amazing. Luciano and others. while the growth stats are amazing my thoughts keep going to the infrastructure needed to make all this happen. Can you talk a bit about the systems you have installed and maintain to keep distance learning going in Brazil. What about the personnel needs to keep everything in top order. What type of problems do you most frequently encounter? It would be interesting to know if the growth in public university education was through traditional brick and mortar schools or through online enrollment. It appears that most of the growth was in the private sector. This is telling and shows that maybe public institutions did not grow to demand. Interesting article and it would be interesting to see what were the forces that drove the expansion in online education. Good article full of things to potentially look at. How does the cost structure differ between online and brick and mortar for the student? Are online classes significantly less expensive? Are online degrees seen as equal to in-person degrees? What are other factors that can be driving or retarding online courses in Brazilian society? To be fair enough, Brazil still has to make a major effort to increase the percentage its Higher Education population. Data from OECD (Organization for Economic Cooperation and Development), places the country in last in a group of 36 countries to assess the percentage of alumni in the population aged 25 to 64 years. 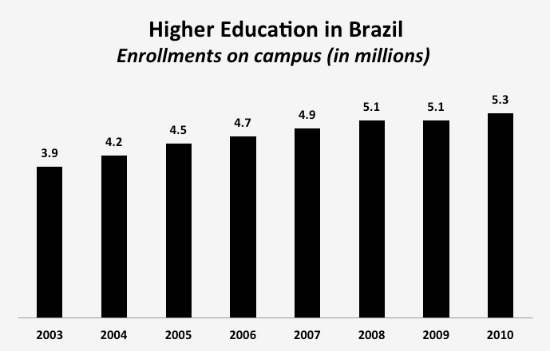 The numbers refer to 2008 and indicate that only 11% of Brazilians in this age group have a university degree. Among OECD countries, the average (28%) is more than twice that of Brazil. Chile, for example, has 24%, and Russia, 54%. As we left a little too low, our evolution, although significant, is still far from the goal that a country like ours needs have. The inclusion of young people in high school level grew, but was not accompanied by an increase in university places, especially at public institutions. The important thing is that Higher Education today is on the agenda of the Brazilian families of all classes. Before, it was restricted to few. We found that people want and they know that Higher Education is important to their new desired life style by several mechanisms. This situation reflects a low number in outcomes from high school. Unlike those emerging countries, young people who can finish high school in Brazil [and would be able to advance to higher education] is very small. As 75% of places in higher education are in private institutions, the data show that we have to be much more agile as we being, because, unfortunately, we lost nearly a century of investment in education. History shows us Europe and other nations like the United States and, more recently, Asian countries decisively opted for education. The Brazil decided that in recent years and now works to pay off this debt. Mostly, Higher Education institutions that reach massive numbers of distance learning offer, in fact, blended learning, which is a legal requirement in the country when it comes to undergraduate. The technologies adopted include live classes broadcast satellite, one or two nights a week, data transmission via satellite or Internet and asynchronous interaction via the internet. Educational materials can be printed and digital, but there is a regulatory requirement of the Ministry of Education to be offered some printed material. And as there is lack of qualified personnel for distance learning, so each institution offers its own training program, especially for teachers, tutors and staff. The costs are very different, distance learning used to be less expensive than brick and mortar. And still there you find companies avoiding to hire people who graduated in distance learning courses, something that has been gradually diminishing but still takes a while to finish. The digital divide exists. I have planned to work with no costs with my Personal contact program coordinator's with no cost. Thats what depicted on my ppt.